I've been telling you each Friday about the fab campaign from Bare Escentuals called Rethink What Matters. Each week, the company is asking women around the globe to join them in their discussion about topics ranging from being more ecofriendly to this week's theme of rethinking your must haves. Mine are simple: my family being happy and healthy, my cozy flannel Nick and Nora pjs on a cold night, and my morning cup of joe from Tim Horton's....and a nice hot bath, too! If you head over to the Rethink What Matters site and take their fun little quiz, you can have the chance to enter to win one of three great lip products. 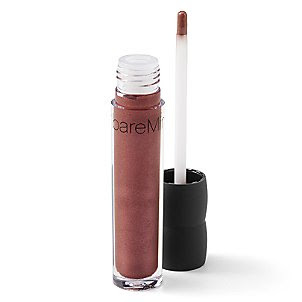 Even better, for my Chic & Green readers, Bare Escentuals is giving away their 100% Natural Lip Gloss to two of you in your choice of colors. THE WINNING NAME WILL BE DRAWN TONIGHT! Each gloss retails for $15. I can tell you that their lip gloss is really nice. In fact, I love this formula and wear Sugar Plum several days a week. *Two (2) winners will be chosen at random on Friday, February 26th at 9pm EST. Winner will be announced Saturday morning 2/27/10.